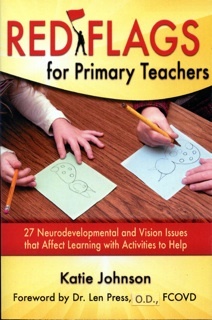 Katie Johnson’s latest book about teaching young children, Red Flags for Primary Teachers, 27 Neurodevelopmental and VIsion Issues that Affect Learning with Activities to Help, has received an Honorable Mention in the 2014 Hollywood Book Festival contest. Contest organizers said, "There were truly a lot of books that will make fantastic films and TV in the future." Red Flags for Primary Teachers tells stories of ordinary children in ordinary classrooms who puzzle their teachers because there is no obvious reason why they are having trouble with reading. After forty years of teaching children how to read and write in classrooms from Maine to Washington, Katie Johnson has seen many such puzzling children. Why can’t some of them learn to read? Katie believes that many children are having trouble learning to read and liking to read because they have problems with their vision – not their eyesight – or problems with their neurological development. Red Flags presents such children, all students Katie has worked with during her long career in teaching first graders. The book is organized in three parts: What I See, What I Do, and What I Have Learned. Each child is presented in a story, a short vignette of classroom life described in an informal retelling of what the child does that Katie notices and is concerned about – that is, a Red Flag. In the What I Do section, Katie gives ideas for activities and exercises which may help the children, and recommendations for professional intervention when needed. For example, when a teacher notices a child covering one eye with her hand as she reads, this should set off an alarm bell in her head that the child may not be using both eyes. Many teachers have never learned about these problems. The winners of the Hollywood Book Festival have been posted on the website http://www.hollywoodbookfestival.com.